Grandma always made the best apple dumplings. 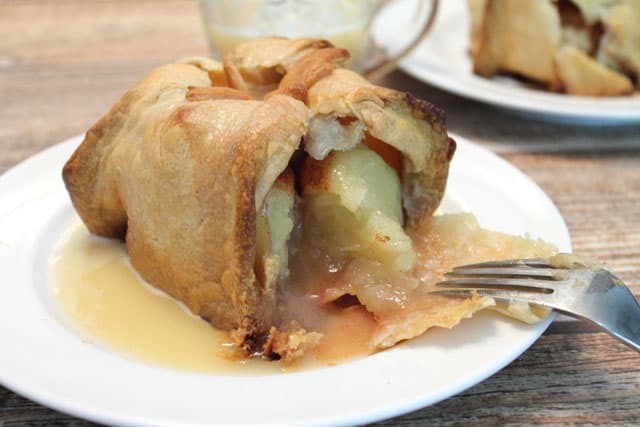 Think warm apples & cinnamon, wrapped in flaky crust & covered with Grandma’s own easy to make vanilla sauce. Yum! It was always a special surprise in the fall when my Grandmother, who lived with us, made her homemade apple dumplings. Seeing her working in the kitchen and putting all that love into her delicious treat was something I will never forget. And the aroma of warm apples baking would just drive my sister and I crazy until we sat down to devour her finished product. I think what made them especially delicious was her warm vanilla sauce. Now, we could have put ice cream on top, which believe me would have been super good, but nothing beat Grandma’s special sauce. 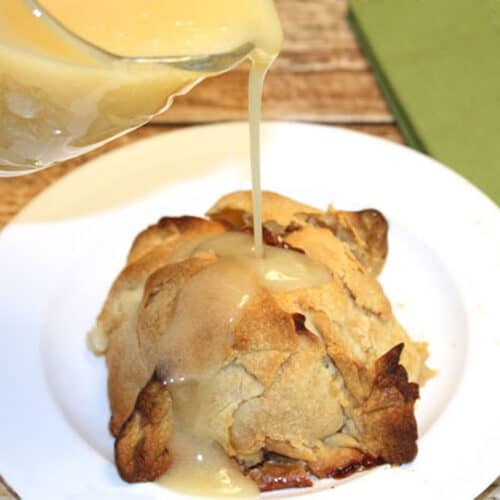 Just that rich taste of vanilla in a creamy sauce just put those apple dumplings over the top! I bet you’re thinking right now “I can’t make those, they look too hard!” but, believe me, they are actually very easy to make. 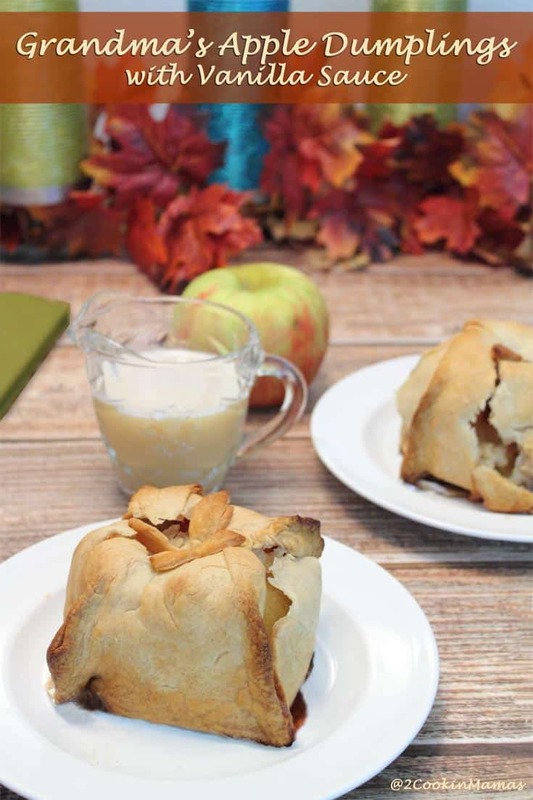 All you need are apples, cinnamon, sugar, vanilla, cornstarch & a pie crust. And if you don’t want to bother with homemade pie crust just pick up a package of rolled pie crust from your grocer’s freezer. It may not be as good as Grandma’s crust but it will certainly get these scrumptious dumplings on your table more often. 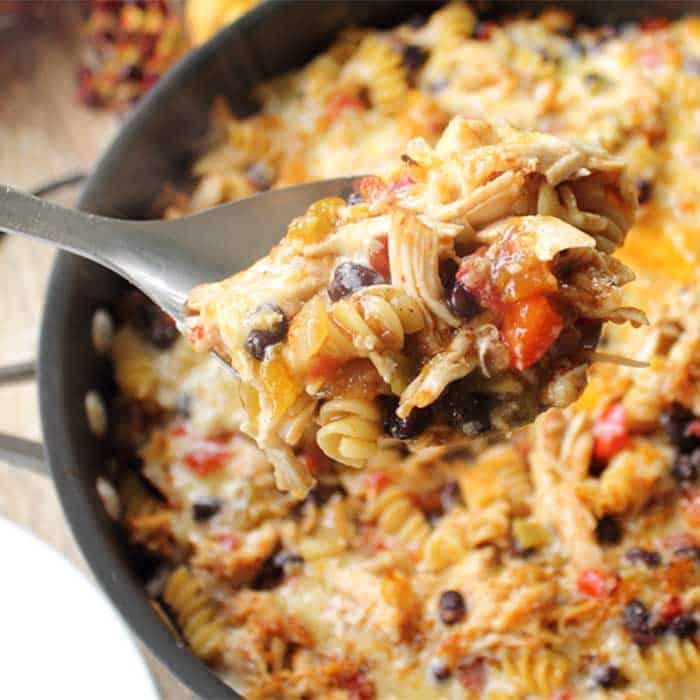 I’m sure Grandma is looking down, smiling, and happy that I’m sharing her special recipe. Hope you enjoy! 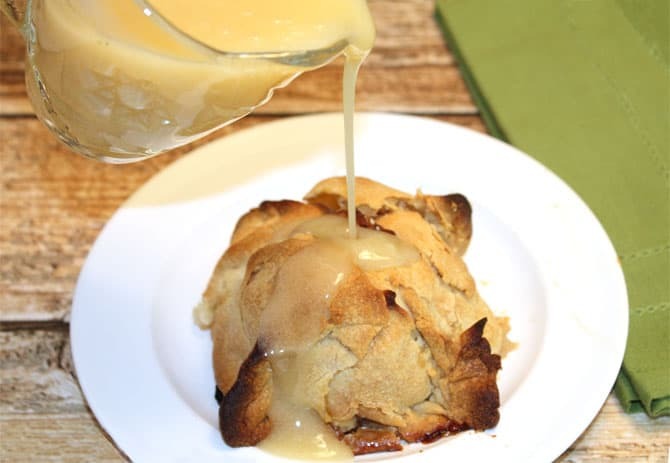 Grandma always made the best apple dumplings. 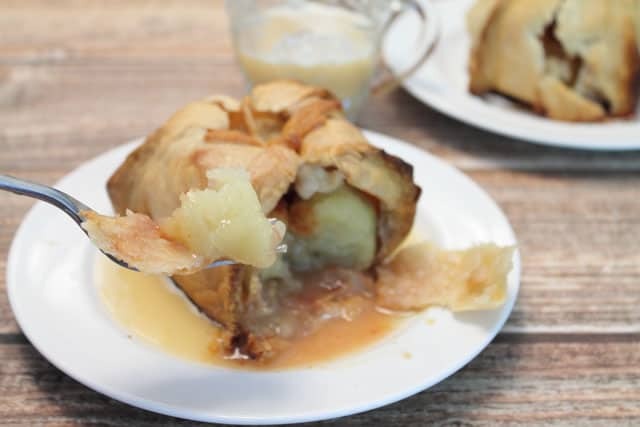 Think warm apples & cinnamon, wrapped in flaky crust & covered with Grandma's own easy to make vanilla sauce. Yum! Mix sugar and cinnamon together in small bowl. Prepare pie crust according to our recipe (double for this recipe) or unroll refrigerated pie crusts. 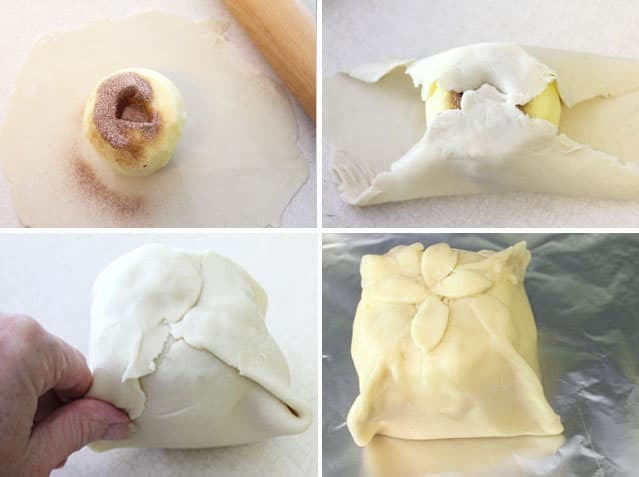 You will get 4 apple dumplings from a double crust or 2 apple dumplings from each refrigerated pie crust round. On a lightly floured surface, cut each pie round in two. Fold around to make a circle and, using a rolling pin, roll out into a thin circle that is as wide as apple is high. Place apple on rolled circle. 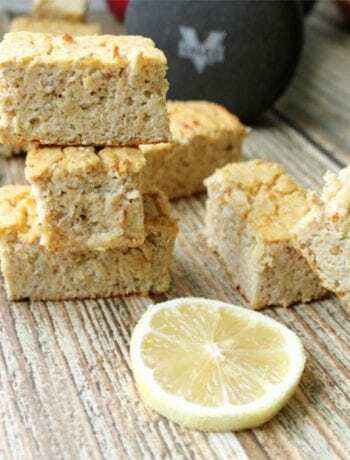 Fill with 1 Tablespoon of cinnamon-sugar mixture. 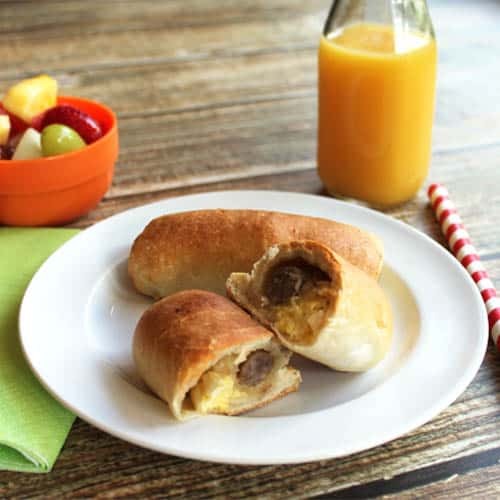 Bring up opposite sides of dough to top of apple. Repeat with opposite sides. Secure all at top by slightly wetting dough and pushing down lightly. Take the corners that are sticking out and fold over to side and pinch. If any holes form in the dough lightly pat them back together as you don't want any of that glorious cinnamon-sugar to leak out. If you want to decorate your apples, use any leftover dough and cut out leaf shapes and place around top. Bake in oven for 45 minutes, covering lightly after the first 20-25 minutes when the dough has browned. Serve hot out of the oven with vanilla sauce on the side or a scoop of vanilla ice cream. In a medium bowl whisk egg, sugar, vanilla and salt. In a small bowl, dissolve cornstarch in a little cold water. Add 1 cup boiling water and stir well as it thickens. Whisk into egg mixture and serve on the side.